Cloudy weather persisted last week till 22nd December and subsequently clear weather persists. The Minimum Temperature is 1 to 2 C below normal while the Maximum Temperature is near normal over most parts of Saurashtra, Kutch & Gujarat. 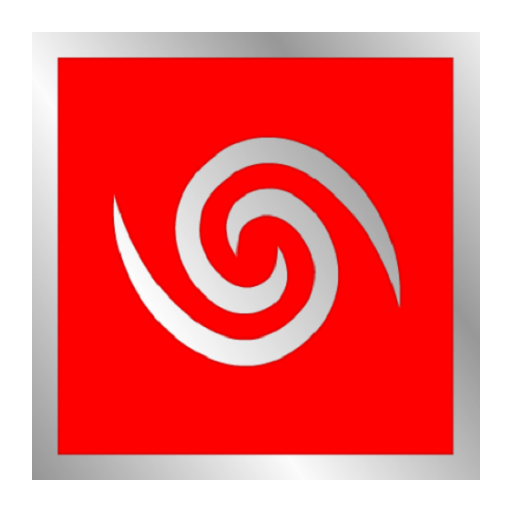 The winds are mainly from Northeast. The Minimum & Maximum Temperature will remain 1 to 2 C below normal till 26th December, and towards normal during rest of December 2017. The Minimum will marginally decrease on 1st January 2018. 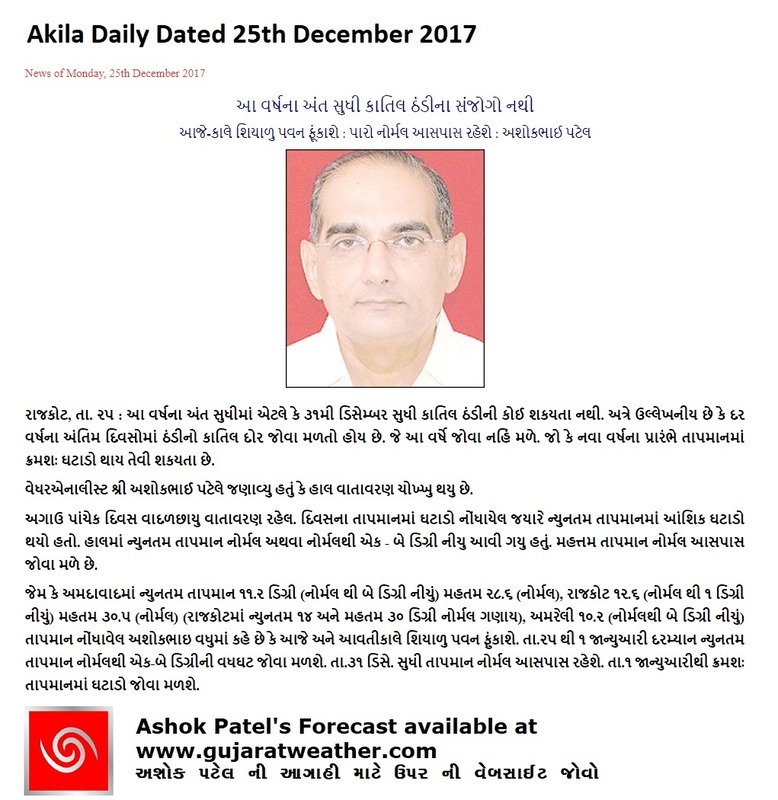 December 2017 will end without major Cold Wave over most parts of Saurashtra, Gujarat & Kutch. ન્યુનતમ તાપમાન 1 થી 2 C નોર્મલ થી નીચું રહેશે 26 ડિસેમ્બર સુધી અને ત્યાર બાદ બાકી ના ડિસેમ્બર માં નોર્મલ આસપાસ રહેશે. 1st જાન્યુઆરી ના ન્યુનતમ તાપમાન માં આંશિક ઘટાડો થશે. 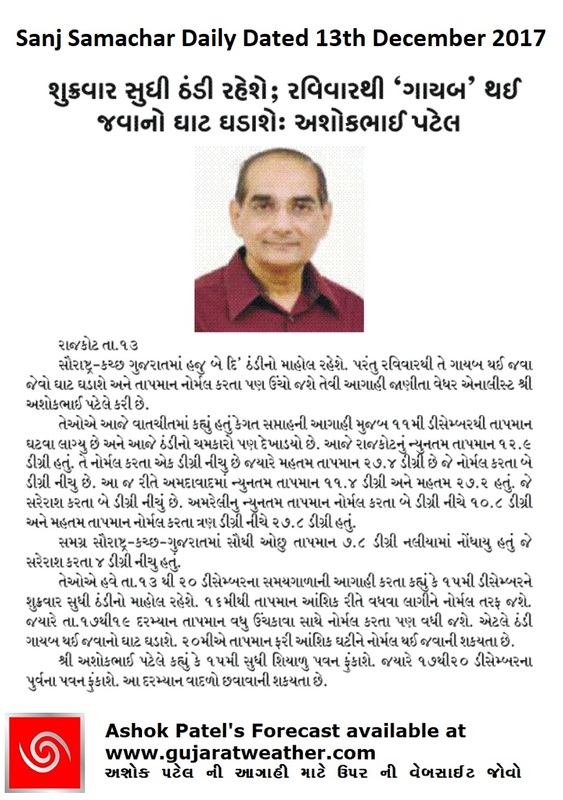 શિયાળુ પવન રહેશે. 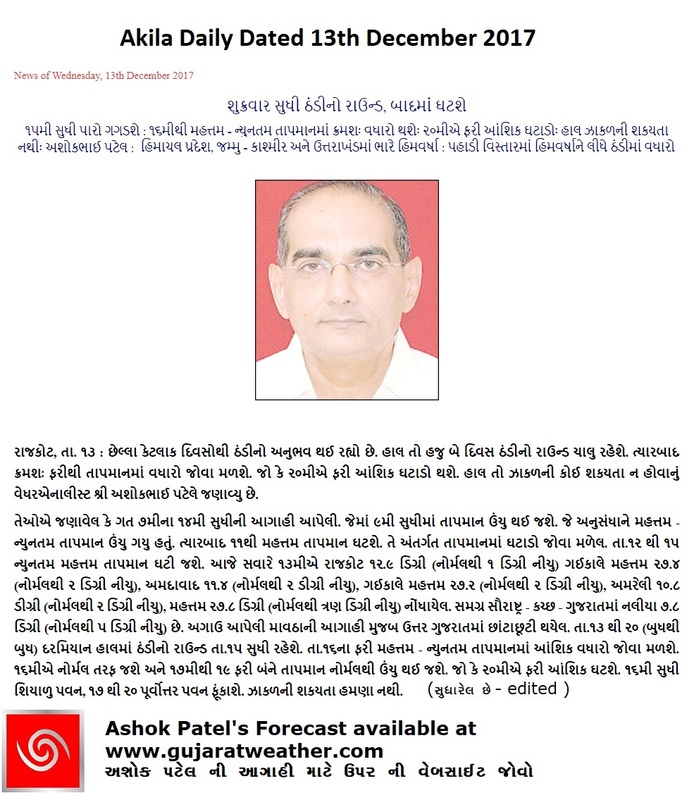 ડિસેમ્બર 2017 કોઈ મોટો કોલ્ડ વેવ વગર પૂરો થશે. The Minimum Temperature declined from 12th December as had been forecast on 7th December. The Minimum as well as Maximum Temperatures are around 1 C to 3 C below normal over most parts of Saurashtra, Kutch & Gujarat. The Minimum & Maximum Temperature will remain below normal till 15th December, and towards normal on 16th December. The Minimum as well as Maximum Temperature will become above normal 17th December to 19th December and marginally decrease on 20th December.